Sure, that may just look like another full Moon picture, but it’s much more extraordinary than that: it’s one of the highest resolution pictures of the entire near side of the Moon ever compiled! This is actually a mosaic of about 1300 separate images taken by the Lunar Reconnaissance Orbiter’s Wide-Angle Camera — the total size is a whopping 24,000 x 24,000 pixels, producing a resolution of about 145 meters/pixel. The full-size version is a monster 550 Mb TIF file (seriously, don’t grab that one unless you need it! ), and you can get a more palatable 1400 x 1400 pixel version with labels, too. The images were taken over the course of two weeks in December 2010. LRO is in a polar orbit around the Moon — think of it as moving in a north/south direction over the surface instead of east/west. 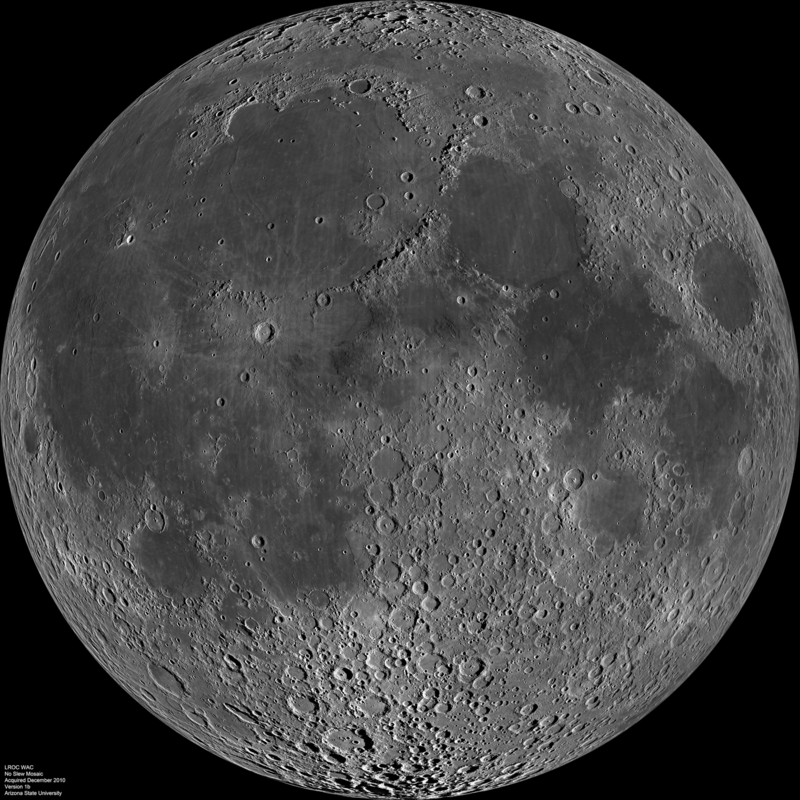 Over time, as the Moon rotates underneath it, LRO can see the entire surface of the Moon. As it does this, the angle of sunlight changes, so care had to be taken when creating this mosaic to make it appear seamless; otherwise shadows would appear to jump suddenly from point to point. If you look carefully you’ll see where shadows point in different directions, but it still looks pretty natural. But it’s not: when you see the full Moon from Earth, that means the Sun is shining straight down on the Moon — the Earth is essentially directly between the Moon and Sun. That means you don’t see any shadows on the surface when the Moon is full. Pictures of it taken from Earth look flat in that case, because our eyes and brains look to shadows to sense the topographical relief — the ups and downs in the surface. But this image shows those shadows, making it a unique view of the full Moon. But it’s also one of the highest resolution image ever made too! You can appreciate that if you look at the full-res 145 meters/pixel zoom-and-panable version, which is simply extraordinary. From the Earth, the sharpest view we can get when taking pictures of the Moon is limited by the roiling air above our heads; the smallest features we can see are roughly a kilometer or so across (sometimes it can be better when the air is steady, but not by a whole lot). Even if we pointed Hubble at the Moon the best it can do is about 200 meters. And even then it would take a lot of images to cover the entire lunar surface. The only way to get better pictures is to go to the Moon! And that’s why these LRO images are so cool. 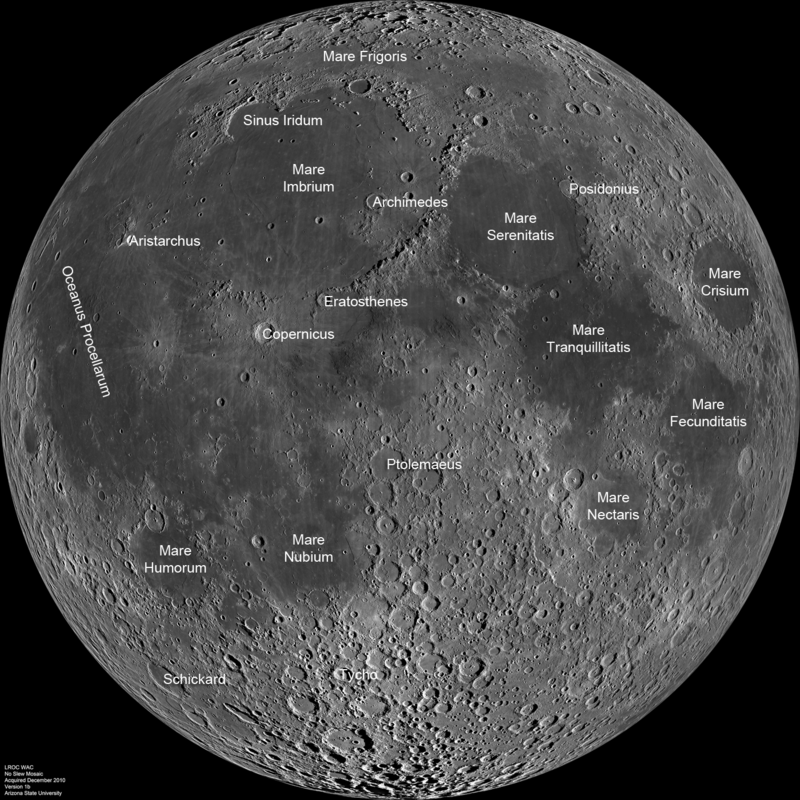 Other missions have gone to the Moon, such as Clementine, the Lunar Orbiters, and Chandrayaan-1. These all produced high-resolution images as well, comparable and in some ways superior to what LRO has done. But it’s actually a bit difficult to find images from those missions put together into one, easy-to-view picture, though. I downloaded the ginormous TIF image, and wow, scanning it is amazing. I saw crater chains (like in the image inset above; I suspect that actually formed from material ejected from an impact just off the frame to the upper right), cliffs, rilles, and tons of other amazing details. I’ve spent a lot of time at the eyepiece looking at the Moon, but I’ve never seen it like this. The detail is amazing, and the shadowing provides a sense of depth you just can’t get when observing the full Moon from home. It’s beautiful. And if your brain is still intact after all that, I’ll note that the camera used to take this mosaic weighs only 900 grams — 2 pounds! And it would fit in the palm of your hand. Amazing. And that’s all it took to get — wait for it, wait for it — the full Moonty. So my advice: take a little time and peruse the zoomable version online, and pretend you’re floating over the lunar surface*. And remember: one day people will get to see this not on their computers, but by the simple act of turning their heads and looking out their window. * Feel free to make rocket zoom and swoosh noises as you do, and don’t be embarrassed: I wasn’t. – Side view of the Moon!